If you’re expecting a typical memoir, you’ll be disappointed. I Was a Child is more like an illustrated storybook for adults. To appreciate it you must let go of the usual expectations of a memoir to enrich you with new insights into the human psyche or inspire you to make positive changes in your life. Abandon those lofty pursuits for a few hours. Instead, snuggle up in your favorite blankie, preferably with easy access to cookies, and travel back to the simpler times of childhood. I promise it’ll be worth every minute. Both Kaplan’s words and drawings spill from the voice of unbridled youth—straightforward, honest, perceptive, unbiased. The child’s point of view is so pure, I am amazed at how the adult Kaplan stayed out of the head of his younger self. And the drawings! Oh. My. Goodness. Throughout the book, Kaplan’s cartooning was the string that yo-yo’d me between personal and universal truths. It made me see both the normal and the absurd child in me. Kaplan’s story is my story, it’s everyone’s story. It’s about retracing life through the eyes of a child, yet understanding and appreciating all of it through the maturity of adulthood. It’s about sifting through events, religion, pop culture, and less-than-perfect people and realizing that, in spite of the flaws and shortcomings, there’s plenty left that’s good, plenty left to shape and mold us into unique individuals. 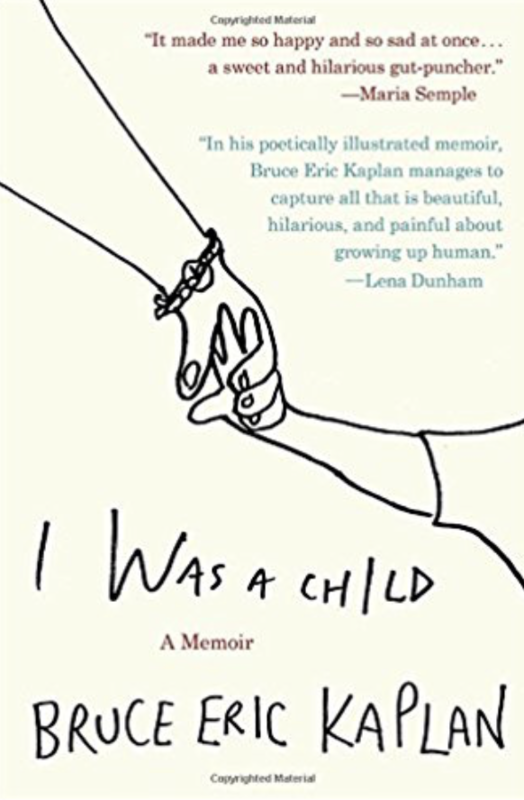 I Was A Child, published by Blue Rider Press, 2015, 210 pp. Besides my father, several hundred are pastors in my circle of family, friends, and church activities. So I’m well acquainted with the varieties in which they come. As a teenager, my favorite kind was those with a bad-boy history (Note to self: Rewatch The Cross and the Switchblade). But NONE of the pastors I know look like or talk like Pastor Nadia. Even the ones with a past of worldly notoriety are just as, or almost as, tame and predictable as every other pastor. Sure, there’s the occasional ponytail or a tattoo peaking out of a sleeve once in a while, but for the most part, all the pastors I know are cut out of more or less the same cookie mold. The frosting may be different on each, but the cookies are all the same. Reading Pastor Nadia’s unorthodox, unfiltered narrative was like eating a fudge cookie after a lifetime of vanilla. It made me somewhat uncomfortable–I liked it, but I wasn’t sure if I wanted the content to infect my soul. It’s like my brain was stubborn, resisting her use of colorful, unholy language to describe holy content. So while reading Accidental Saints I had to remind my stodgy righteous self to do more than hear the raw, straight-from-the heart voice of Pastor Nadia. And when I truly listened, I saw her and others—not as mere people—but as God’s children. They were testimonies of grace and compassion, of discovering Jesus. Yet the book is not really about the men and women who meander into Pastor Nadia’s life and ministry. Each chapter is about how she finds in someone new a little bit of God. The book is also a guide for the reader on how to turn everyday encounters into opportunities to be like Jesus—to be a saint. I need to be broken apart and put back into a different shape by that merging of things human and divine, which is really screwing up and receiving grace and love and forgiveness rather than receiving what I really deserve. The sting of grace is not unlike the sting of being loved well, because when we are loved well, it is inextricably linked to all the times we have not been been loved well, all the times we ourselves have not loved others well, and all the things we’ve done or not done that feel life evidence against our worthiness. Love and grace are such deceivingly soft words—but the both sting like hell and then go and change the shape of our hearts and make us into something we couldn’t create ourselves to be (p. 180). Accidental Saints has made me question the status quo of my Christianity. And that’s a good thing—even if it makes me squirm a little. For the record, I received this book for free from Crown Publishing Group (a subsidiary of Random House) for reviewing it on my blog. Not all great preachers are great writers. Mark Batterson is one of the few who are. Like my favorites, Max Lucado and Charles Swindoll, Batterson has the cadence of a poet and the wisdom of a pastor. God is in the business of strategically positioning us in the right place at the right time. A sense of destiny is our birthright as followers of Christ. We’re inspired by people who face their fears and chase their dreams. What we fail to realize is that they are no different from us. In the beginning, the Sprit of God was hovering over the chaos. And nothing has changed. God is still hovering over chaos. The premise of this book is that you can experience success and blessings when you boldly chase after dreams that come from God—be it those revealed in the faintest of whispers in your subconscious or those packaged in calls heard loud and clear. The book then goes on to prove this premise by shuffling examples and practical lessons, beginning with Benaiah. And because I’m a sucker for nobodies who surface as heroes, I love that Benaiah and his lion-chasing bravado on a snowy day is the foundation of this book (despite reviews—like this one—that question the heroic details of the story). For me a story doesn’t have to be accurate in order to inspire and motivate me. The storyteller and preacher in Batterson were successful in making me assess missed opportunities, while recalibrating my life lenses with a vow to make the rest of my life on earth more accountable to my Creator God. In spite of the much needed motivation I received from this book, I did find that everything from the illustration of Benaiah to the contemporary examples to the practical tips could have been sandwiched into a much shorter book. The repetition of some content and fillers had me speed reading through much of the book. Other than this shortcoming, I really like this book and have passed it on for someone else to benefit from its encouragement. For more information about the book from Waterbrook Multnomah, go here. To learn more about Mark Batterson and his ministry, go here. And for the record, I received this book from Blogging for Books for this review.